Classic yet contemporary design. Luxurious fabrics and finishes. Impeccable quality and perfect fit. Artful style and timeless design. 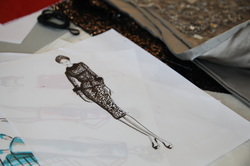 Women's wear offered through the luxurious experience of couture and demi-couture design. This describes Primeau. Fashion designer Richard Beckel has been creating elegant, artful and timeless fashion for over 20 years. Primeau takes its name and fashion philosophy from the designer’s mother. “She had a small but top-fashion wardrobe with quality pieces from designers like Dior, Schiaparelli, Nipon, and De La Renta that look as stylish today as when she wore them. Women who appreciate the pleasure and value of wearing high-style, quality garments that look great season after season will love Primeau. Richard was introduced to couture techniques at the world-class design institute Ecole de la Chambre Syndicale de la Couture Parisienne in France. Also a graduate of New York’s Parson’s School of Design, Beckel was one of a select few designers chosen for both Parson’s gallery exhibition and their annual spring runway show. He continued to distinguish himself by winning the first Minneapolis Macy’s Distinction in Design competition. He has accomplished all of this while working in corporate America, living his design passion after hours. Richard brings his couture skills, impeccable eye for design, and passion for people to clients who seek the incomparable experience of working directly with a designer for custom and semi-custom fashion. Primeau provides a custom- or semi-custom fashion experience for clients by appointment in Richard’s Paris-style salon and workroom.